The debut novel The Woman In The Window won critical acclaim... and we can see why! A. J. Finn is the pseudonym of Daniel Mallory, a publishing executive. A native of New York, Finn lived in the UK for 10 years, studying at Oxford. He is a former book critic, who is now back in New York City. His debut novel, The Woman In The Window, was one of my choices for the March meeting of our splendid crime fiction book group. It was a birthday present and I was really looking forward to reading it. On the cover it is described as ‘Astounding, thrilling, amazing’. Never a truer word. And into this restricted, claustrophobic life come the new people in the house across the park – the Russells – mother, father and teen-aged son. One evening she has a visit from Mrs Russell, with whom she gets on really well. The very next day a scream is heard, and then Anna watches helplessly through the widow as Mrs Russell is stabbed to death. Anna is on a cocktail of strong drugs for her condition; she also consumes a lot of alcohol, mainly wine, and is often drunk – something totally forbidden with her medication. And consequently nobody, even the police, believes her when she reports what she has seen. Because of her condition, her drug regime and her heavy alcohol intake even I started to doubt her sanity and her version of events. Had it really happened, or was she so lost in her twilight world that she had conjured it all out her dark imagination – helped along by her fascination with film noirs – especially those by that grandest master of them all – https://www.britannica.com/biography/Alfred-Hitchcock"]Alfred Hitchcock[/link] himself? This is a really frightening story of a woman whom nobody will listen to or believe. Who is being ridiculed and belittled by her neighbours and the police. Who is being threatened with wasting police time. Anna is so fragile that I truly thought she was going to break, either mentally or even physically. And of course, all along in the shadow, there is a culprit who in the end comes for Anna. 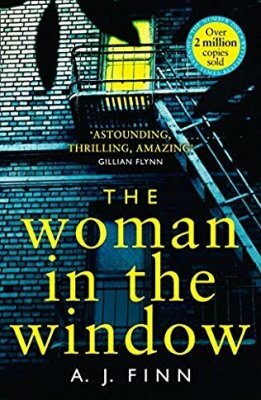 This book has strong shades of that brilliant film noir thriller Rear Window with James Stewart and Grace Kelly, but it is several notches more terrifying than the film. I really liked Anna – such an unusual heroine – and I was really hoping that she was sane, that she would prevail and that she would conquer her agoraphobia. This book is well written, well-constructed, compelling, but not for the faint hearted. So terrifying, in fact, that at one stage I put it down thinking ‘I can’t read this’. But I am glad I did. I hope you will be too. If you enjoy reading crime fiction why not come along to one of our meetings? Because of Easter, our next meeting will be on Friday, 26 April 2019. Otherwise, we usually meet on the third Friday of every month, at 2.30pm in Oundle Library. We don’t have a set reading list. We just chat about the books we’ve read and enjoyed. Everyone welcome!